One way to treat your dry and damaged hair is to provide the nutrition that your hair is lacking, right? Although it’s true that treating damaged hair is hard. But if you are applying the right ingredients, you will definitely get soft and shiny hair. 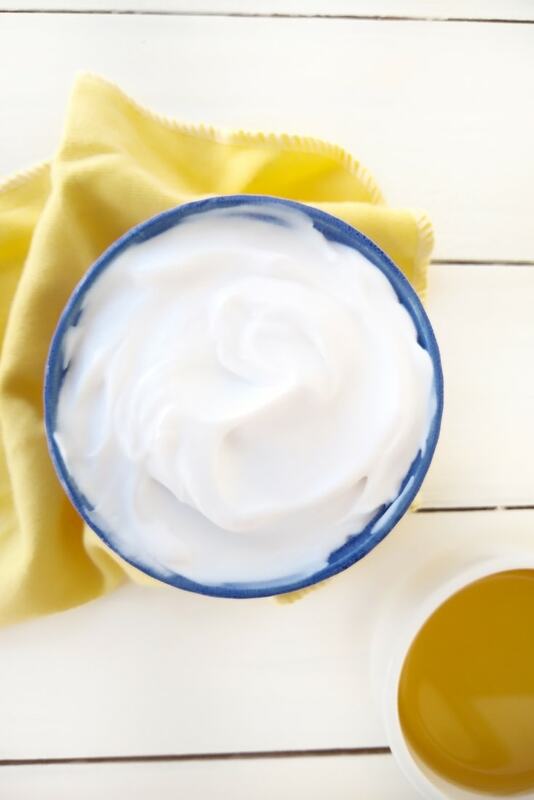 Now when it comes to the remedy, coconut milk hair mask is exactly what you need. Coconut milk contains some essential nutrients like vitamin C, vitamin E, folate and niacin. It also has protein and fats. These nutrients work to moisturize and repair your dry and damaged hair. This coconut milk hair mask also contains argan oil and olive oil. These two carrier oils boost the efficiency of this hair mask for treating damaged hair and also help promote hair growth. In this post, I will be sharing a recipe for DIY coconut milk hair mask that you can easily make at home. But before heading down to the recipe, let’s talk about the benefits in detail that your hair will get from this hair mask. One of the main reasons for damaged hair is your hair lacks protein. Coconut milk contains protein which repairs damaged hair strands. It also nourishes your hair follicles. This makes your hair strong and prevents breakage. It has vitamin C and Vitamin E which are powerful antioxidants. These antioxidants neutralize harmful free radicals which help in preventing scalp cell damage. Often scalp cell damage weakens your hair follicles and leads to hair loss. It is a rich source of fats which penetrate through your scalp and cuticles. This helps in deeply conditioning your hair and makes your hair soft and shiny. It contains niacin and folate which improves blood circulation in the scalp. This helps in promoting thick and strong hair growth. READ: How do you part curly hair when it’s dry? It contains essential fatty acids which is one of the most important nutrition for your hair. Essential fatty acids hydrate as well as moisturize your hair. This helps tame frizzy hair, making your hair soft and manageable. Argan oil is high in vitamin E which makes it a very effective carrier oil for boosting hair growth too. Vitamin E improves scalp circulation which allows your hair follicles to get much-needed oxygen and other nutrients. This encourages the follicles for hair growth. One of the main reasons for dandruff is an oily scalp. When your scalps are dehydrated, sebaceous glands are forced for the overproduction of oil. This clogs your hair follicles which leads to excessive shedding of cells and ultimately cause dandruff. Argan oil hydrates your scalp and balances the scalp oil production. Hence treat dandruff. Olive oil cleanses your scalp by removing dirt, dead skin cells and excess oil clogged in your hair follicles. This helps treat hair thinning and prevent hair loss. It conditions your hair by providing much-needed hydration to your dry hair strands. Hence makes your hair soft and manageable. It is a rich source of fatty acids that moisturize your hair by balancing the sebum production. This moisturizing property of the oil seals the cuticles and prevent moisture from escaping. It contains iron that carries oxygen to the roots. This helps maintain the health of your hair as well as promote hair growth. Mix all the ingredients properly in a bowl to make a spreadable hair mask. Massage the mixture into your scalp and then work it through your hair, from the roots to the tips. Once you are finished with applying the hair mask, cover your hair with a shower cap. Leave the mask on for an hour. Now wash your hair with organic shampoo. Repeat it twice a week for treating your dry and damaged hair. Coconut milk is definitely such ingredient that you should include in your hair care routine. It contains powerful antioxidant properties that ensure a healthy scalp. It has fats, vitamins, and proteins that bring your dry, dull and damaged hair back to life. Hence using this DIY coconut milk hair mask on a consistent basis, you would not only treat your damaged hair but also make it beautiful and healthy. Now you have got the recipe of this amazing DIY coconut milk hair mask, so start using it right away. Have you applied the coconut milk hair mask before? If so, please let me know in the comments down below.